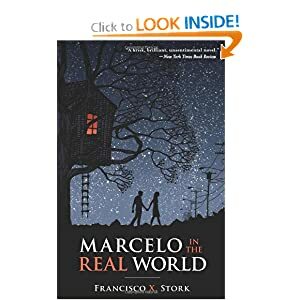 And, today’s YA author in the spotlight is: Francisco X. Stork. Enjoy! AUTHOR: (information comes from the author’s website (http://www.franciscostork.com): Francisco Xavier Arguelles was born in 1953 in Monterrey, Mexico, to his single mother, Ruth. She later married Charles Stork, who adopted Francisco and gave him his last name. The three moved to El Paso, Texas, where they struggled to make ends meet. For his seventh birthday, Charlie gave Francisco a portable typewriter because Francisco announced he wanted to be a writer. Two years later, Charlie Stork died in a car crash. Francisco and his mom stayed in El Paso. Francisco was awarded a scholarship to the local Jesuit High School. He received a full scholarship to Spring Hill College in Alabama, where he majored in English Literature and Philosophy and received the college’s creative writing award. After college, a Danforth Fellowship allowed him to attend graduate school at Harvard University, where he studied Latin American Literature. Francisco then went to Columbia Law School. His plan was to make a living as a lawyer without abandoning his plan to write fiction. Twenty years and twelve or so legal jobs later, Francisco published his first novel. He has published five novels so far: THE WAY OF THE JAGUAR, BEHIND THE EYES, MARCELO IN THE REAL WORLD, THE LAST SUMMER OF THE DEATH WARRIORS, and IRISES. MY TWO CENTS: This description doesn’t do the novel justice. I listened to this one on audio. Stork’s writing is simple yet beautiful. He masterfully crafts a story that includes issues of religion, love, friendship, loyalty, ethics, and conscience. He also creates a main character who is Mexican-American with a “developmental disorder,” but the narrative is about so much more than those two elements. I’ve been reading lots and lots of blogs and comments about the need for diversity in YA. Many have called for authors to include racially or ethnically diverse characters in stories that are not necessarily about being a person of color (i.e. the newly arrived immigrant or POC vs. the majority). If this is what some readers want, then this novel is a model. A great read! I don’t know what took me so long to get to this one! Find MARCELO IN THE REAL WORLD on Amazon.com, Barnes and Noble.com, IndieBound.org, and Goodreads. This is a truly amazing book.